The Best Buy deal is back! The card is now just $29.99 at Best Buy (free shipping), which is definitely the best price we've seen so far. With Black Friday looming on the horizon like the dark lord of some retail apocalypse (well, that's how we see it - we have to write about it), you're going to see almost unending deals on external storage for your smartphone. And, sure, maybe if you don't care about how fast that card is because it's going in a smart TV box or just being used as a photo storage dump, a simple $10 microSD card can be just what you're looking for. 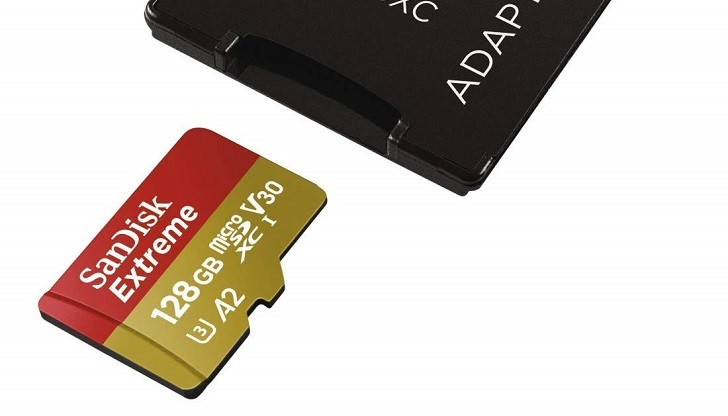 But if you want the best microSD card you can buy right now, there's actually only one obvious choice: SanDisk's new line of App Class 2 "Extreme" cards (we promise, this isn't an ad). These cards just came out a little under a month ago, and they're already discounted significantly - the 128GB card was around $37 on Amazon at the time of this posting, and the 256GB card is (admittedly, a far less appealing) $105. So, before you pull the trigger on that ultra-cheap 128GB card on Amazon Gold Box or NewEgg, maybe think about what you'll be using it for. If you want the best performance possible, there really is only one king of the hill right now, and it's these SanDisk cards. This is the "Extreme PLUS" variant of the card, which is ever-so-slightly faster than the regular Extreme one on Amazon (about 10MB/s faster reads). Regardless, it's a steal at this price, so go and get it. Amazon's price has dropped to just a little over $35, the lowest it's ever been. 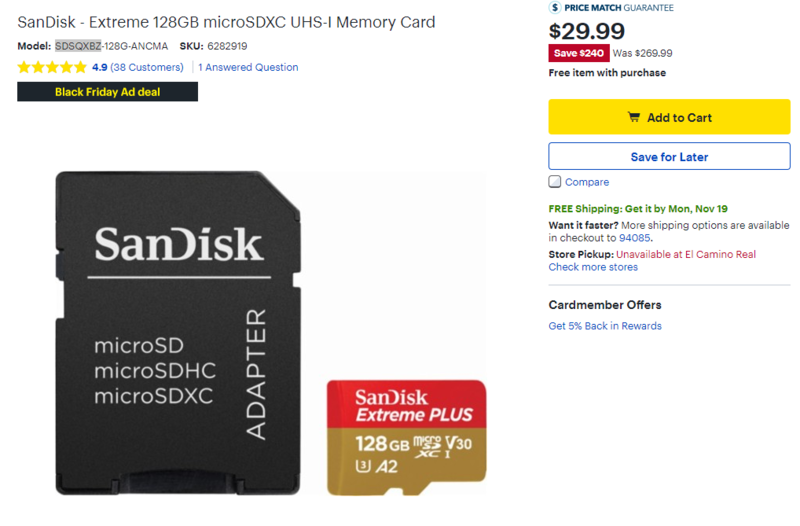 Not as good as the brief Best Buy deal below (which has since gone up to $55), but it's still an insanely good price given this is by far the fastest microSD card lineup on the market right now (and the only A2 class cards out there). 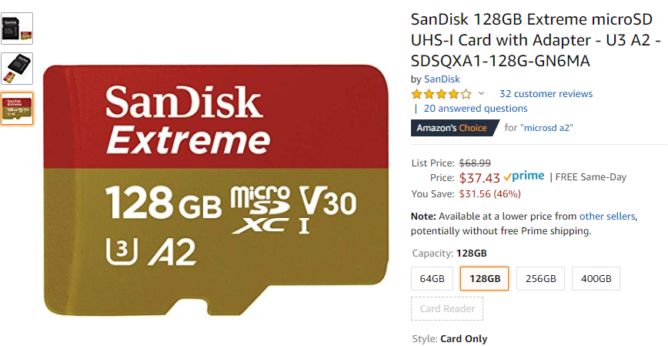 A reader points out that these Amazon cards are actually slightly slower than SanDisk's Extreme Plus version of this card line - the 128GB Extreme Plus card (which has advertised read speeds around 10MB/s faster - not a lot, but not nothing) is actually available at Best Buy for just $29.99 right now (Update: It's now $55 - so we recommend the $37 Extreme card on Amazon above! ), making it faster and cheaper. I'd pull the trigger on that one ASAP if you don't mind buying from Best Buy, as this Extreme Plus card is far pricier (over $100) on Amazon at the moment. SanDisk also makes an Extreme Pro-branded line of these cards, but the advertised read and write speeds are the same as the Plus models at Best Buy. The Pro cards seem to have very sporadic availability and are priced much higher (the few places they're even available), so we don't really recommend them for the time being anyway.